Superior cutting disc with extra-long life. The Rhodius 125mm Combination Disc XTK35 provides extra-thin cutting and rough grinding without the need of changing the disc. With three full-face fabric layers, the Rhodius 125mm Combination Disc XTK35 has an extended lifetime compared to standard cutting discs. The cutting disc also features the HydroProtect formula, slowing down the ageing process of the disc caused by moisture and retaining the cutting performance sustainably. 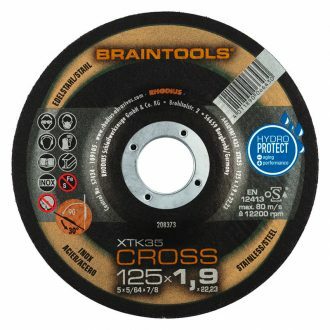 The Rhodius 125mm Combination Disc XTK35 is part of the Braintools® series. Cutting Discs in this range consist of innovative products with a unique characteristics for problem solving.